STRATFORD, Conn., May 30, 2017 /PRNewswire/ -- Lockheed Martin (NYSE: LMT) today announced it successfully reached a key milestone – the Air Vehicle Critical Design Review (CDR) – for the U.S. Air Force's Combat Rescue Helicopter (CRH) program. This event prepares the program to proceed to assembly, test, and evaluation of the HH-60W helicopter. The joint Sikorsky and U.S. Air Force (USAF) helicopter program team met in May with key partners from government and industry for an in-depth design review. Throughout the review, the CRH team successfully presented a design that participants were confident would meet system requirements. Review participants included leaders from USAF and key suppliers who took part in the technical presentations. "This milestone is an important achievement and demonstrates Sikorsky and the Air Force are well aligned on the technical requirements of the HH-60W," said Tim Healy, Sikorsky CRH program director. "We got here by conducting several milestones on or ahead of schedule, and we are committed to staying on that track as we build the first HH-60W aircraft." In preparation for the CDR, the joint team generated more than 300 technical documents, created and reviewed over 50,000 hardware and software requirements, conducted 17 sub-system CDRs and designed 3,000 new parts. "The joint team did an outstanding job in documenting the design of the HH-60W," said Jim Andrews, Sikorsky CRH chief engineer. "We are excited to enter the build phase as the team has leveraged digital design tools to generate manufacturing efficiencies that will reduce cost and schedule. This approach will lead ultimately to the HH-60W becoming the first Black Hawk derivative to have a paperless assembly line." 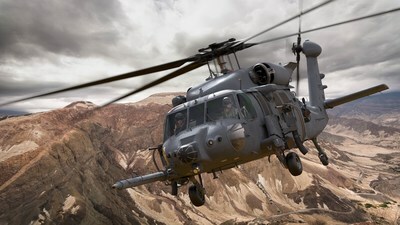 The USAF awarded Sikorsky the $1.28 billion Engineering Manufacturing & Development (EMD) contract in June 2014, which includes development and integration of the next generation combat rescue platform and mission systems, delivery of four HH-60W helicopters, aircrew and maintenance training systems, and support for both. In January of 2017, the USAF exercised a $203 million contract option with Sikorsky to provide five additional aircraft, bringing the total to nine. The training suite includes devices that span full-motion simulators and discrete aircraft systems, such as hoist and landing gear. The USAF Program of Record calls for 112 helicopters to replace the Air Force's rapidly aging HH-60G Pave Hawk helicopters, which perform critical combat search and rescue and personnel recovery operations for all U.S. military services. The HH-60W is an advanced variant of the UH-60M Black Hawk helicopter design and features increased internal fuel capability for greater range. The CRH aircraft will feature GE T700-701D engines, composite wide-chord main rotor blades to sustain maneuverability at high density altitudes, and a new fatigue- and corrosion-resistant machined aero-structure to ensure reliability and availability to USAF operational units. The design includes an advanced Tactical Mission Kit integrating multiple sensors, data links, defensive systems, and other sources of intelligence information for use by combat rescue aircrews. The aircraft is designed with a weapons and cabin configuration specifically optimized for combat rescue and recovery operations. "Conducting the Air Vehicle CDR demonstrates this helicopter system is well on its way to meeting the key program requirements of the Air Force," said Dave Schairbaum, USAF, CRH System Program Manager. "Successful execution of the program is essential to meet the continued demanding personnel recovery mission in today's challenging operational environment. We are working closely with Sikorsky to assure this newly designed aircraft meets the requirements, is affordable and is delivered on schedule to the warfighter." The CRH and USAF teams will meet again in September for the Training Systems Critical Design Review. This press release contains forward looking statements concerning opportunities for development, production and sale of helicopters. Actual results may differ materially from those projected as a result of certain risks and uncertainties, including but not limited to changes in government procurement priorities and practices, budget plans, availability of funding and in the type and number of aircraft required; challenges in the design, development, production and support of advanced technologies; as well as other risks and uncertainties including but not limited to those detailed from time to time in Lockheed Martin Corporation's Securities and Exchange Commission filings.